SkyBar at Traders Hotel, Level 33, Traders Hotel, Kuala Lumpur City Centre (KLCC), Kuala Lumpur 50088. +60 3 2332 9888. 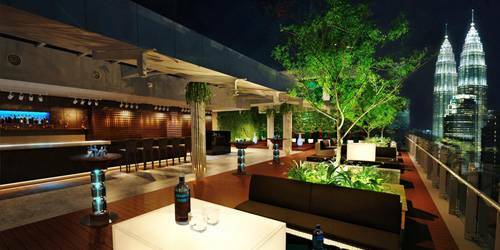 The rooftop lounge now offers a floor-to-ceiling view of the bustling, lighted up city. It offers guests the ultimate in cool drinks and intoxicating views. Smoking is permitted in all areas of SkyBar. Sun to Thurs 10am-1am. Fri, Sat and eve of Public Hols 10am - 3am. Shangri-La. Gobo Upstairs Lounge & Grill, Level 6, Traders Hotel, Kuala Lumpur City Centre, 50088 Malaysia. +60 3 2332 9888 Lounge: 11am-1am. Grill: 11.30am-2pm. 6.30pm- 1pm. Petronas Towers view. Shangri-La. The Revolving Bintang Restaurant, 18th Floor, Federal Hotel, Jalan Bukit Bintang, Kuala Lumpur 55100. +60 3 2148 9166. Great view at night. Views of the KL tower and Petronas towers. Daily : 5pm-12 midnight. Dinner Service 5pm-10.30 pm. Live entertainment in the evenings except Mondays. Atmosphere 360 Revolving Restaurant, Kuala Lumpur (KL Menara Tower), TH02, Jalan Punchak, Off Jalan P. Ramlee, Kuala Lumpur 50250. +60 3 2020 2121. 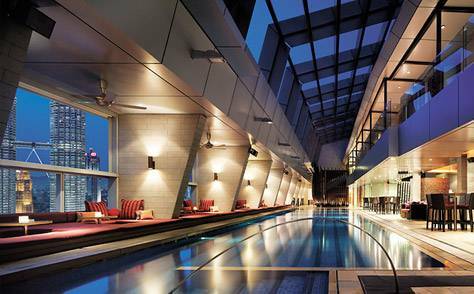 Boasts a revolving panoramic view of the Kuala Lumpur City Centre and the Klang Valley. Sitting at 282 metres above ground level, it is ranked the 4th highest revolving restaurant in the world and the highest in South East Asia. Lunch 11am-1pm, 1.30pm-3.30pm. Afternoon Tea 2pm-6pm. Dinner 6.30pm-10pm. The 39 Restaurant, Darby Park Hotel, 10 Jalan Binjai, Kuala Lumpur. +60 3 7490 3939. Rooftop restaurant with enchanting views of City's skyline. Walking distant to KLCC. Soi 23, 23rd floor, Pacific Regency Hotel, Menara Panglobal Jalan Puncak, 50250 Kuala Lumpur, Malaysia. A view of city skyline. Buffet Breakfast 6.30am to 10.30am. Lunch Thai and Fusion a la carte. 12 noon-2.30pm. Afternoons Fusion a la Carte 2.30pm-5.30pm. Dinner: Thai and Fusion a la Carte 6.30pm-11pm. Luna Bar, 34th Floor, Pacific Regency Hotel, Menara Panglobal Jalan Puncak, 50250 Kuala Lumpur, Malaysia. +60 3 2332 7777. Surrounded by towering skyscrapers and offering a splendid 360? view. Mon to Thurs 5pm-1am. Fri & Sat & eve of Public Holidays 5pm-3am. Sun and Public Holidays 10am-1am. Malaysian Petroleum Club (MPC), 42nd floor, Tower 2, Petronas Twin Towers, KLCC Center, Kuala Lumpur 50088. Atmosphere Revolving Restaurant and Bar, 18th floor, Menara Tun Mustapha (formerly known as the Sabah Foundation Building), Likas Bay, Kota Kinabalu, Sabah 88300, Borneo, East Malaysia. Borneo's only revolving restaurant.